Fitbit has made a name for itself by churning out devices for the average person who does the occasional run, swim or cycle. The company now has a wide range of fitness bands and a couple of smartwatches in its range. The Charge 3 is the long-anticipated sequel to Fitbit’s best selling fitness band. It comes with a number of important upgrades including a larger screen, water-proofing, 7 days battery life, smart features, an added sensor and more. In fact, you could almost say it’s now a smartwatch disguised as an activity tracker. I’ve been wearing the new fitness band since its launch about a month ago. Is Charge 3 really a worthy upgrade to perhaps the best selling fitness tracker of all time? Here are my impressions. Holiding Charge 3 in your hand, it feels strangely familiar. That’s because its not a distant cousin of Charge 2, its a better looking sibling – a clearly recognizable, but shinier and more premium looking version. The most obvious difference is the 30% larger OLED display. It now measures 38mm x 18.3mm x 11.8mm which makes everything a bit easier to read. The screen is fully responsive to touch and supports gray-scale colors versus just B&W. The backlight adjusts to changes in lighting conditions. Indoor visibility is great, outdoor visibility is fine although in sunny conditions you may struggle to read some of the text. This is Fitbit’s first wearable with an inductive button. And while it does take a bit of getting used to, it give you a tactile vibration feedback to let you know it’s working. The San Francisco outfit has done away with the physical button in order to improve water-resistance. You can use the button to wake the tracker or alternatively simply tap on the screen. If you choose, you can also activate the Screen Wake function by long pressing the inductive button and tweaking the settings. This will light up the display every time you lift your wrist. Navigation is done by swiping on the display. Down will take you to notifications, up through your fitness stats, left and right through other apps and functionality. Everything feels very responsive and slick. If you’ve used a Fitbit device before, you’ll feel right at home. It simply works, no instructions needed. You can customise the main screen with a number of different clock-faces. I opted for the one which shows the time, my daily steps and current heart rate as I like to keep tabs on my heart rate throughout the day. Selecting a clock face in the app will automatically sync it with the tracker. At 29 grams Charge 3 is slightly lighter than its predecessor. So much so that you’ll hardly feel it on your wrist. Its also a bit thinner. Fitbit says the new device is built of very lightweight material which includes an aerospace grade aluminum case and Corning Gorilla Glass 3 display. Straps carry standard watch-style clasp mechanisms and are interchangeable, so you can tailor the wearable to your liking. Unlike its predecessor, this is a one-size fits all affair. In the box Charge 3 comes with a large and small strap which you can use depending on your wrist-size. Fitbit has opted for straps which have a plasticky feel, and while I’m not a great fan of these at least they do not leave a rash like their silicone counterparts. Fitbit says you need to wear the band loose enough so that it can move back and fourth. When you are exercising you may want to tighten it a bit so that it has a better read of your heart rate. Packed under the hood is Fitbit’s full gamut of sensors. This includes a 3-axis accelerometer, optical heart rate monitor, altimeter, vibration motor and NFC (in special editions only). Fitbit says the heart rate sensor has been improved and is better at keeping tabs on your ticker during high-intensity activity. The relative SpO2 sensor is also there, but we are impatiently waiting for Fitbit to put it to actual use. It has the potential to monitor for conditions such as sleep apnea, allergies and asthma. The Sleep Beta program has launched, so hopefully the wait will not be too long. Unfortunately there is no built-in GPS. Like most other devices in Fitbit’s range, you’ll get Connected GPS which means the tracker piggy-backs on your smartphone for readings. Not ideal when running but better than no GPS. Battery life is an excellent 7 days on a single charge. In my testing I found the tracker had no problems reaching this figure. This is 2 days or 40% longer than on Charge 2. To refuel – simply plug the proprietary charging cable into a USB port, connect it to your tracker and make sure its gold pins are aligned. It takes about an hour or two get back to full capacity. Waterproofing seems to be the norm these days and Charge 3 has a water-resistance rating of 5 ATM (down to 50 meters depth). Unless you are a deep sea diver, this should suffice. The gizmo will track your swim sessions, too. In real-time you will only be able to see swim duration on your wrist, but laps and pace can be viewed in the smartphone app post-swim. Charge 3 works best as a casual tracker collecting data on steps, calories, distance, floors and sleep. Fitbit has had this side of things nailed down for quite some time now, so expect more of the same. In terms of exercises, the fitness band allows you to choose from a range of fitness modes. This includes bike, swim, run, weights, yoga and more. Each comes with its own set of metrics, screens and more. There’s also a new goal-based exercise mode. This lets you set a specific calorie, time or distance goal ahead of your workout and then track it during your exercise. New users will first need to download the smartphone app which talks you through the set-up process. Type in a few basic details such as your height, weight and gender, pair your tracker by entering a four digit number from your Fitbit and allow the firmware to update. All this takes less than 10 minutes from start to finish, and is a straightforward process. Fitbit’s app is one of the best ones out there. It’s simple to use and doesn’t overload you with data. You can edit this screen to your liking by adding and removing tiles. By default, the dashboard shows our step count, floors, distance, calories, active minutes, number of days you have exercised (out of a weekly recommended total of 5), your sleep statistics, heart rate and hourly activity. Click on any of these for further breakdowns. The step count and other basic stats are fairly accurate and the app will break them down into minute detail. The number of floors climbed is a bit hit and miss – but this is the case with all fitness trackers. The same applies to calories. All in all, no complaints on the quality of data. Not surprising as Fitbit is one of the pioneers when it comes to these things. Fitbit sleep statistics have recently benefitted from an upgrade. You now get Light, Deep and REM sleep info. The values are calculated by combining accelerometer data, heart rate variability (the time between beats), and Fitbit’s proprietary algorithms. 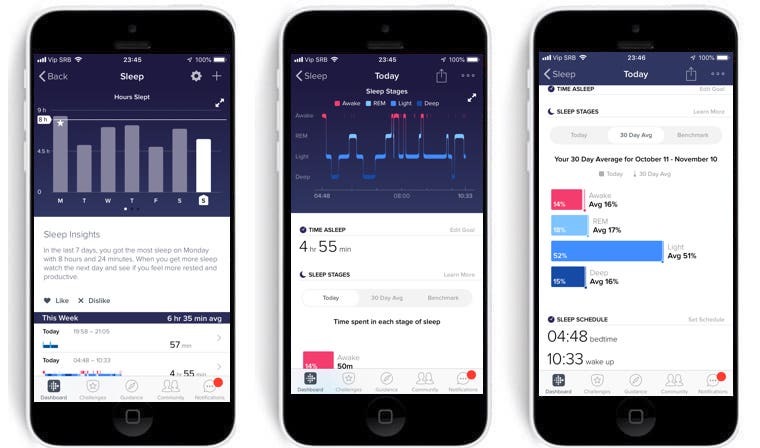 The Sleep Insights feature uses all your activity and diet statistics to discover trends and then dish up personalized guidance on how to improve your nightly rest. The more you wear your tracker to bed, the more personalized insights you may receive. You can also define personalized sleep goals including bedtime and wakeup targets; reminders to stay on schedule, and a sleep schedule history to chart your progress. Finally, there’s a silent alarm function which does a fairly good job of waking you up by vibrating at a set time. Having said that, if you are a heavy sleeper, its probably not a good idea just to rely on the vibrating alarm. The tracker also does a good job of monitoring your ticker throughout the day. As mentioned, the heart rate sensor is more accurate than on Charge 2. The smartphone app automatically tracks your resting heart rate in the morning and charts its movements via daily and monthly graphs. Your resting heart rate is probably the best indicator of your health and fitness so its important to keep an eye on its value. It does a decent job for more intense activities such as a steady run in the park, but for high intensity workouts or interval training the accuracy it will not be on par with chest straps. It never is on wrist-based trackers. You’ll also get a Cardio Fitness Score based on your estimated VO2 Max. This is calculated using your user profile and resting heart rate. It shows how you compare to those of the same age and gender, and ranges from poor to excellent. Fitbit had me pegged at 49, which is just 0.4 short of the excellent range. You’ll also get get guidance to take action and improve your score over time by increasing exercise frequency, intensity, or by reaching a healthier weight. The device has automatic exercise recognition but you can also start a workout manually. This, however, involves multiple taps. First you need to find the Exercise app on the device, choose the activity, wait for the GPS signal to be established with the smartphone app (if you want to use Connected GPS), and tap to start the activity. A single press on the haptic button will pause the activity, a double press followed by the display’s “finish” icon will end the activity. All in all, there are quite a few steps here and I can’t help but feel this could have been made much simpler. Unfortunately, the inductive side button isn’t customizable to start workouts. During a workout, the Charge 3 display only shows three bits of information at once and the small font makes some of these difficult to read. Swiping left and right will change the metrics. Post workout you’ll be able to view a summary of how you’ve done right on the screen. I’ve done multiple runs during the past few weeks with Fitbit Charge 3 on my right wrist and Garmin Forerunner 935 on my left wrist. The data was fairly similar, but there were a few discrepancies. For example a recent 8km run yielded the following results. On Fitbit’s device the average pace was 5:47″, elevation gain 54m, average heart rate 154bpm (41 mins peak, 5 mins cardio), 677 calories burned, distance 7.92km. Garmin’s sports watch churned out the following stats: 5:41″ average pace, elevation gain 50m, average heart rate 154bpm (39 mins peak, 2 mins cardio), 648 calories burned, distance 8.00km. As you can see, the heart rate data was fairly in sync, dishing out the exact same average heart rate for the run. The chart below shows a comparison of the heart rate data – the yellow line is Fitbit Charge 3, the blue line is Garmin Forerunner 935. My view is, unless you are a serious runner, the Charge 3 will suffice. If you are a serious runner, you are best off with a chest strap and a more sophisticated GPS smartwatch. Last but certainly not least are the smart features. These have progressed so much that they are starting to blend the line between fitness tracker and smartwatch. Charge 3 comes with call, calendar, text and smartphone app notifications. The larger screen makes these easily readable. To read the full text you will need to reach for your smartphone. Third-party notifications from social media do not show on the fitness band. Android phone users are able to send pre-canned quick replies thanks to a recent software update. You can also accept, and reject and calls. To accept a call that is coming through, simply tap the check mark on the Charge 3 screen. To reject a call or send the caller to voicemail, tap the X icon. Much like the Versa and Ionic, Charge 3 comes with apps such as Alarms, Timer and Weather. Calendar, Fitbit Leaderboard and popular third-party apps will be added in the future. So no app store at the moment, nor a watch face store. The one other thing that is missing is on-board music storage. Or a way to control your smartphone music remotely from your wrist for the matter. Finally, if you’ve purchased the Special Edition Fitbit Charge 3 you’ll now be able to its NFC chip for payments on-the-go. Fitbit Pay is currently supported by more than 100 banks in 18 countries. Everything is managed from the Wallet section of the Fitbit app. This is where you can add/remove payment cards, set a default card, edit payment methods and review recent purchases. Smartwatches may be all the rage at the moment, but there’s still a market for people who prefer fitness bands. Charge 3 is one of your best options if you fall into the latter group. Fitbit is not reinventing the wheel here. The San Francisco-based outfit has had the fitness tracking side of things nailed down for quite some time now. So expect an upgraded experience in the form of a larger display, water-proofing, more accurate heart rate monitor, longer battery life and contactless payment capabilities (for a little extra). And lets not forget the SpO2 sensor which Fitbit will, hopefully, put to actual real-world use in the near future. The device preforms best as a casual tracker. And while it’s feature-set is not on par with its big brother, the Fitbit Versa, it brings much of its functionality to a more compact and lightweight design. For the average person who wants to monitor their activity 24/7, and who does the occasional run here and there, Charge 3 checks all the boxes.